Members of TBTI participated at the 7th World Fisheries Congress held in Busan, South Korea, 23-27 May, 2016. This congress series is arguably the biggest and most comprehensive academic meeting on fisheries, and this year’s installment certainly lived up to that expectation. With 36 organized sessions (many of them stretching over a half day or even a full day) on a wide range of fisheries topics from bycatch, climate change effects, aquaculture, inland fisheries to more technical subjects including stock assessment methods, genomics, and post-harvest food sciences, this meeting was particularly significant for presenting an opportunity to gauge wider trends in world’s fisheries research and allowing a general snapshot of “what’s hot” across themes and geographical regions. In that respect, it was possible to observe a conspicuous presence of small-scale fisheries in the conference program and in many of the presentations. TBTI is currently planning to capture this encouraging development in a more systematic manner and communicate as an accessible research output. Contributing to the excitement was a dose of controversy provided by Professor Ray Hilborn of the University of Washington as he took on the stage to deliver one of the keynote addresses on his view on why large-scale industrial fleets are the way to go in terms of achieving fisheries sustainability in the world. 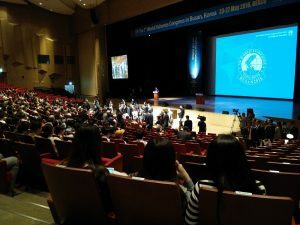 Overall, combined with the Korean-style operational efficiency, ceremonial fanfares as well as culinary delicacies offered at the conference site, it made a worthwhile and enjoyable scholarly experience.